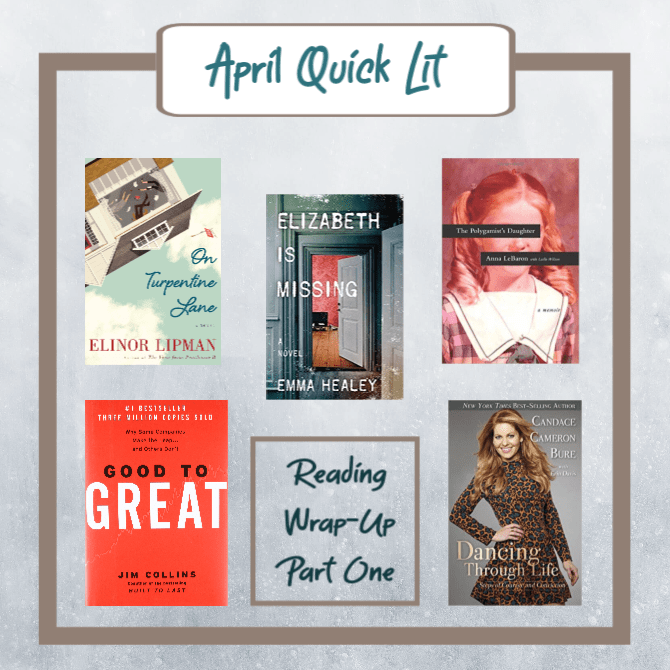 It’s time for our first round of April book reviews! Today’s batch of books ranges from somber to silly. A couple of the titles were somewhat disappointing, but still worth the read. Enjoy the reviews! Dancing Through Life: Steps of Courage and Conviction, by Candace Cameron Bure: Candace Cameron Bure is one of my very favorite celebrities. It’s not that she’s a high-caliber actress (although I do enjoy her acting on Fuller House), but I LOVE how vocal she is about her faith, and the ways she uses her platform to point people to Jesus. If this book were written by anyone else, I would have given it a hard pass, but coming from Candace (whose book Kind is the New Classy was one of my favorite books last year), I decided to give it a shot. I haven’t watched Dancing With the Stars since we cut the cable over a decade ago, but in my former TV-watching life, I was a pretty big DWTS fan (the only reality show I watched), so I knew the book’s backdrop. Candace shares about her journey through DWTS, from being invited onto the show to making it into the Final Three. Candace provides some fun insights into the making of the show and the time and effort that went into each performance, and she shares how the show gave her the opportunity to walk out her faith in front of millions of viewers. Candace discusses the way her beliefs shaped her entire experience, from the costumes she was willing to wear to the dance moves she would or would not perform. 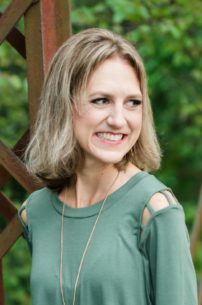 It was helpful and inspiring to see the ways Candace relied on Scripture reading, prayer, and Christian community to inform her behavior and her actions every step of the way. I also was impressed by the book’s positive tone: Candace has NOTHING but nice things to say about her fellow competitors and others within the DWTS scene—evidence that she was living out her “kind is the new classy” mantra even before that book was written! While God used Candace in some big ways through her presence on the show, He also used the experience to shape the actress herself. In the book, Candace is honest about her struggles while filming DWTS, including battling people-pleasing tendencies, insecurity, and negative attitudes. I appreciated her vulnerability and teachable spirit, which is every bit as inspirational as her willingness to talk about God in front of the camera. 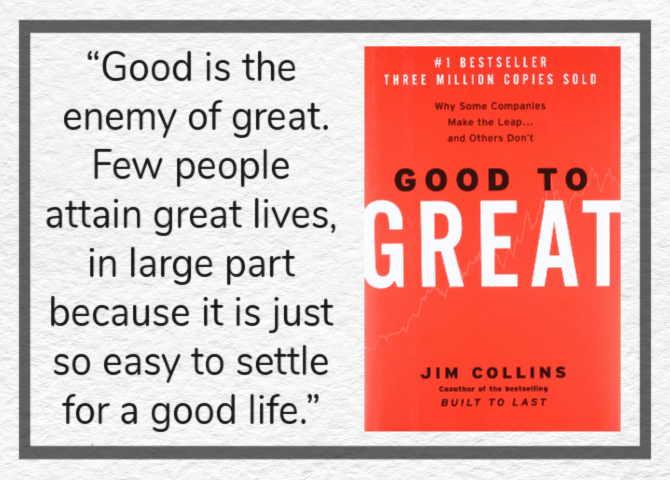 Good to Great: Why Some Companies Make the Leap and Others Don’t, by Jim Collins: As someone who is neither a business owner nor an employee, I’m hardly the target demographic for this book. However, after hearing Jim Collins interviewed by Tim Ferriss recently, I became fascinated by him and his work and thought this classic business book would be a good place to learn more. The content in Good to Great stems from a long-term study on elite companies that achieved great results that they then maintained for at least fifteen years. In thoroughly examining these companies (which included Kimberly Clark, Walgreens, Circuit City, Wells Fargo, and many more), Collins and his research team identified the qualities present in each of these truly great companies including: Level 5 leadership; mastery of the Hedgehog Concept (the place where passion, mastery, and economics intersects); a Culture of Discipline; and focusing on the who of a team over the what. Throughout the book, Collins uses stories from these inspiring companies and from his personal life to show young businesses how they, too, can move their own companies from good to great. Many of the findings discussed in this book are quite interesting, and I enjoyed thinking through their applications to my own life, outside of the business world. I also liked Collins’ narration and his enthusiasm for his subject. However, the writing is repetitive and not especially engaging (although I’m sure I would have enjoyed this more if the content had been more relevant). I also found it difficult to put faith in the book’s findings, given that many of the featured companies have failed since Good to Great was published in 2001. While this doesn’t necessarily invalidate the book’s suggestions and insights, it’s a powerful reminder of the transiency of success—for companies, and unfortunately, for this book. 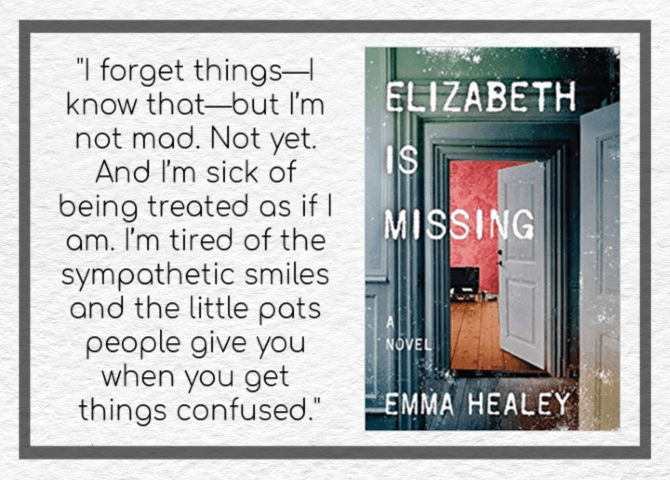 Elizabeth is Missing, by Emma Healey: Elizabeth is Missing features a unique spin on the unreliable narrator premise. Maud is an elderly woman who is slowly descending into dementia. Maud regularly writes and posts notes to herself as reminders of daily routines and matters of business, and many of her recent notes have centered around her good friend, Elizabeth, whom Maud is certain is missing. Elizabeth solicits help from her caretakers, and her daughter, Helen, and even attempts to contact Elizabeth’s suspicious son, but nobody will assist her in finding her friend or even acknowledge that Elizabeth is missing. As Maud’s memory declines, her search for Elizabeth becomes mentally entangled with a long-ago search for Maud’s sister, Sukey, who went missing shortly after WWII. While the mystery of Elizabeth’s disappearance soon becomes apparent (to the reader, if not to Maud), we remain in the dark as to what happened to Sukey, and how the two untrustworthy men in Sukey’s life may have played into her vanishing. I don’t know quite how to feel about this book. As an exploration of aging, memory, and identity, it is phenomenal: Emma Healey has captured the experience of dementia with incredible care and frightening accuracy. In reading Maud’s frantic thought processes I, too, felt as though my mind was slipping away. My heart broke for Maud and her increasingly frustrating circumstances, and also for her middle-aged daughter as she slowly loses her mother to mental illness. This topic hit especially close to home as we are going through similar situations with two family members; while Maud’s experience helped me to understand and empathize with our family members’ plights, my personal connection made this a painful read. As a mystery, this book didn’t work for me. The present-day conundrum has a heartbreakingly obvious answer. As for Maud’s 1940s-search for her sister, it took me a while to get into that story, simply because the flashbacks were so sporadic and hazily shared (likely intentional on the author’s part to convey Maud’s confusion over her memories of the past). And I was not at all satisfied with the book’s open-ended conclusion; after drawing close to these characters, I wanted and needed more from the ending. Please don’t go into this book expecting a fast-paced thriller or beach read. This is beautifully rendered, but incredibly sad and a very slow read. Perhaps if I’d had more realistic expectations about the stories this book was sharing, I would have appreciated it more. The Polygamist’s Daughter, by Anna LeBaron: As I shared in my review of Educated, this type of memoir isn’t usually a genre I’m drawn to, but when I heard Anna LeBaraon as a guest on What Should I Read Next and detected the hope and joy in her voice, despite her traumatic past, I knew I wanted to read more of her story. Anna LeBaron grew up the daughter of Ervil LeBaron, the leader of a radical Mormon cult who fathered more than fifty children with his thirteen wives. Because Ervil was wanted by the FBI for ordering the deaths of anyone who attempted to leave his cult, Anna was raised in poverty, constantly on the run with her siblings and the other sister-wives. Her childhood was one marked by child labor, starvation, and evenings spent “gardening” (dumpster diving) for clothing and food. 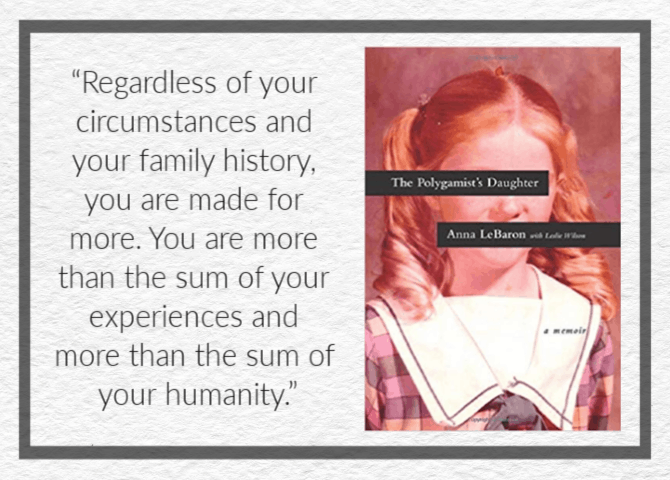 Anna longed to be known and loved by her parents, even as she witnessed the disfunction of their family and knew she was being groomed for a lifetime of sexual abuse and polygamy. Anna’s story is heart-wrenching, but also inspirational, marked by hope, perseverance, and faith. We read of the terrifying lengths she went to in order to escape the cult, and we witness her blossoming faith in Jesus. Her process of gradually letting go of her past as she grows more deeply in love with God is particularly beautiful. My feelings about this book are very similar to the way I felt about The Tattooist of Auschwitz: this is an incredible story, and I admire the author’s courage in sharing it with the world, but I felt like it could have been SO MUCH BETTER if the writing style hadn’t been so . . . mediocre. Though Anna’s story should have been riveting, the narration drags. Anna glosses over important details and rushes through the most exciting pieces. I was surprised that such a colorful story could seem so dull. This book broke my heart for Anna and those like her who have experienced such atrocity. However, if you’re looking for a sad-but-redemptive memoir, I’d recommend Life From Scratch or Educated over this one. 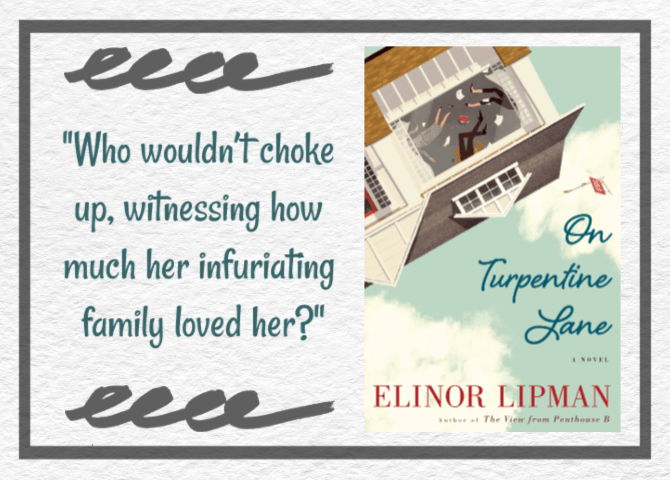 On Turpentine Lane, by Elinor Lipman: Thirty-two-year-old Faith Frankel has recently returned to her suburban hometown, where she works for her alma mater as a professional writer of thank you notes. Faith is excited about her recent purchase of a quaint bungalow on Turpentine Lane, where she lives alone whilst her hippy fiancé, Stewart, embarks on a crowdfunded cross-country walk. Unfortunately, Stewart doesn’t see the need to respond to Faith’s texts or phone calls while he’s away. Not long after moving into her new home, Faith discovers some mysterious artifacts and begins to realize she may be living at the site of a historic murder. Unsupported by her (increasingly estranged) fiancé, and overly supported by her older brother Joel and their meddling Jewish parents, Faith decides to take on a boarder in the form of her attractive coworker, Nick Franconi. Together, Nick and Faith navigate their mutual disastrous love lives, attempt to straighten out Faith’s father (whose recent behavior is not fitting of a sixty-something father and husband), and try to get to the bottom of the mystery that is the house on Turpentine Lane. I read this right after finishing Matchmaking for Beginners because I adored that book and was in the mood for another light romantic comedy. I’d heard great things about Elinor Lipman’s book and thought this might be just the novel I was looking for. On Turpentine Lane delivered in terms of being a “light read,” but failed to meet my high expectations. It’s funny, but only moderately so, and the comical aspects are almost too absurd. The love story felt contrived, and the mystery didn’t really make much sense to me. It didn’t help that none of the characters were particularly endearing, though I did appreciate the sweet brother/sister dynamic between Faith and Joel. Like Faith’s little bungalow on Turpentine Lane, this book has some good bones, but didn’t satisfy my dreams in quite the way I wanted it to. That said, I plan to read more from Elinor Lipman before making my final verdict on her as an author. Next week I’ll be reviewing a hot new thriller, a heartwarming biography, a gorgeous historical novel, a Christian living book I adored, and a shocking journalistic piece that reads like fiction. Until then, happy reading! Hi, I’m Kendra! I am a follower of Jesus, an avid reader and podcast-listener, an Enneagram enthusiast, and a big fan of lists. Born and raised in Southern California, I am now living life in Austin, Texas, with my husband Luke, our 4-year-old son, Charleston, and Arlo the Labradoodle. Thanks for visiting my blog!